XOLO, after doing well in the smartphone market, now seem to have set their eyes on the tablet segment. This is evident after the launch of XOLO’s first tab – the XOLO Tab. The device is competitively priced at 13,499 INR and comes with a decent set of internals that will allow the device to stand against other similarly priced tablets in the market. The company did impress with their smartphones and it is a known fact that XOLO devices come with a better build quality when compared to other domestic brands. Will the company be able to replicate the success in the tablet segment as well? Well, we can’t answer that as of now, but it would surely be very interesting to see. The XOLO Tab comes with a rather bland set of cameras even by tablet standard. The device packs a 2MP rear and a VGA front-facing camera. We believe both these units would be fixed-focus type, so do not expect any miracles as far as photography is concerned. As our readers must be aware, we aren’t big fans of the 4GB internal memory concept deployed by many domestic and Chinese manufacturers to decrease cost. Apparently, XOLO does not pay heed to such woes and the XOLO Tab comes with just 4GB of ROM out of which about 2GB should be available to the end user. You know your device doesn’t have enough storage when the amount of RAM and ROM are comparable, which is the case with the XOLO Tab as well. The tablet comes with a very decent set of internals as far as this category is concerned. 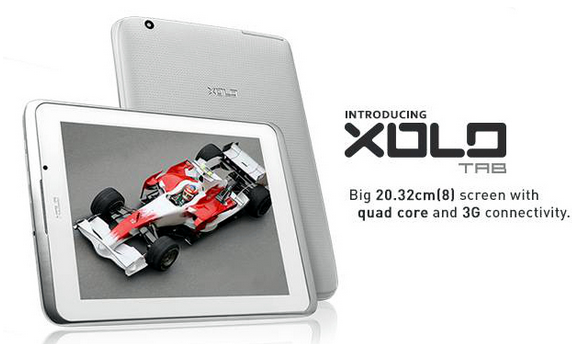 The XOLO Tab packs a very impressive quad core processor from Qualcomm, clocked at 1.2 GHz. This processor should be able to handle most apps and games you throw at it, that is, if it doesn’t fall short of RAM. The quad core processor should be a notch above the common MT6589 you see on most other domestic devices, in terms of performance as well as power efficiency. The XOLO Tab packs a 4000mAh battery which again turns out to be a pro as far as the device is concerned. The battery should give you about 4-5 hours of screen on time, which should translate to 1-2 days of usage depending on your style. This is probably the only category about this tablet that doesn’t stand out from other similar devices. Having said that, let us also add that although it does not come with something unique, it is, by all means, as good as any other with it’s 8 inch 1024×768 display. Rings a bell? Yes, this is the same resolution as that on the highly successful iPad mini tablet. We cannot blame XOLO for adopting the same form factor simply for the reason that it is sure to be a commercial success and that is what XOLO are in the market for. The device will have Android v4.1 pre-installed which is a bit of a let down, since most other devices come with v4.2 out of the box. However, an update should be expected soon. XOLO have done well to give the device it’s own independent look unlike other domestic manufacturers. Most other devices in this range have a rather uncanny resemblance to the trademark Samsung design which doesn’t impress one and all by any means. Connectivity is the device’s USP; it comes 3G enabled, which will not only allow you to browse the net but make phone calls too, which is an added bonus. You need not worry about WiFi hotspots or 3G modems during travel anymore. The device will have an array of competitors as you might have already expected. Out of these, a select few such as the Google Nexus 7, Samsung Galaxy Tab 3 (WiFi only version), Simmtronics XPAD Mini and the Swipe MTV Slate might pose as serious threats. The device does impress with it’s specifications and the fact that it comes 3G enabled. The 8” form factor has found a lot of takers, which means this probably will be the size potential buyers look out for. With a decently sized battery, XOLO would hope the device does not disappoint. However, the absence of Android v4.2 might put some off. We hope that XOLO irons these issues out as soon as possible, since we think this device has the potential to be a hit in the market.